Insight: Pair programming has helped engineering teams improve communication, effeciency and code quality since the early 1990s. A similar form of the method applied to product design has been hidden in plain sight for many years and rarely practiced by design teams. It's a great time to help share the benefits of pairing for designers and improve the way teams work together. Goals: Improve efficiency and communication skills for design teams by building a brand, tools and workshop around the method of pairing with a design partner. 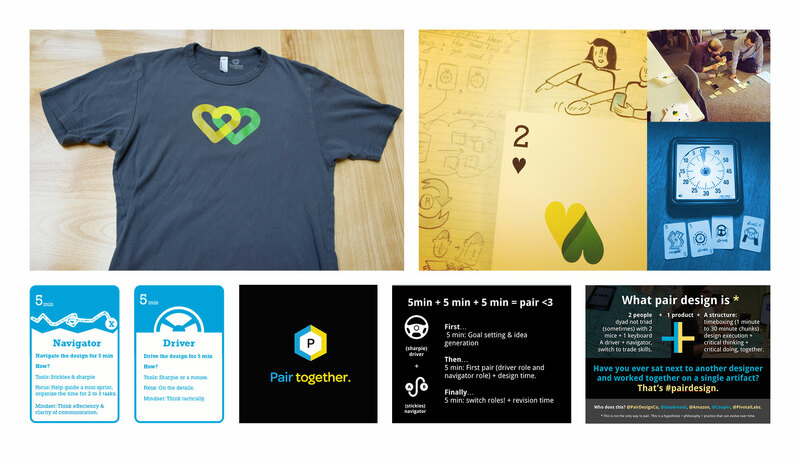 Challenges: Branding, workshops and method cards are great tools to inspire design pairing but are not the end of the story for improving how designers work together. Also, developing a design habit like pairing can be challenging and not a comfortable working style for everyone. Regardless, the effort towards developing skills in critical thinking, design efficiency and clear communication are valuable skills for any product and design team to learn and pairing is a great way to develop these skills.